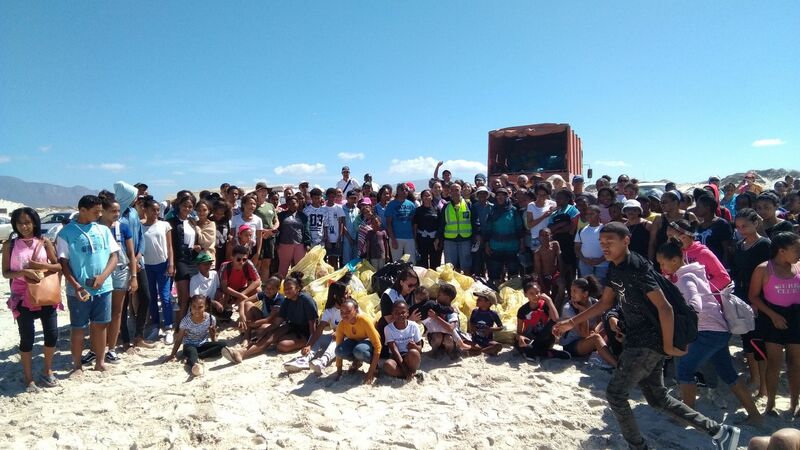 On the 21st March 2019 the Diocese of False Bay banded together as more than a hundred and fifty individuals both young and old joined together to clean up the beach between the Muizenberg and Strandfontein Pavilions. Eager parishioners joined up early on their public holiday to make a statement that we all need take pride in respecting God’s creation, and to protect our False Bay coastline with all its beauty and splendor which is which is has been tarred by pollution. The eco-friendly campaigned was led by a dynamic group from three archdeaconries, with many clergy also making an appearance on the day and helping to pick up the litter. The event was made even more special as Miss Earth SA Margot Fargo joined in the venture and also motivated the youth on the importance on protecting our environment and to change our mind-sets around plastic. Our very own Rev Rachel Mash also shared a message with the participants whereby she encouraged everyone to think about the ocean’s ecosystem and our impact on it. She then also invited everyone to take a moment to soak in the beauty of the False Bay and remember that which we need to protect. The campaign saw numerous bags of dirt collected and was a testament to those around that some of our waste is landing up in the oceans and on our beaches. Passers-by were also struck by the crowd as they saw the people walking down the sandy beach strip picking up litter. As a country we celebrated Human Rights’ Day which reminds us that we all have the right to a clean environment and a clean ocean. If there is anyone that has photos of the day please don’t forget to tag us in and to add the #hashtag #protectfalsebay, or if you plan on doing a clean-up in your own community you can post the photos to social media and tag it with #greenanglicans.